Well hello there all. It has been a busy week. It is the last week of summer break before the rest of our staff gets back so we have been busy trying to tie up loose ends. Tons of fun…not! Now another picture in honor of Carol. 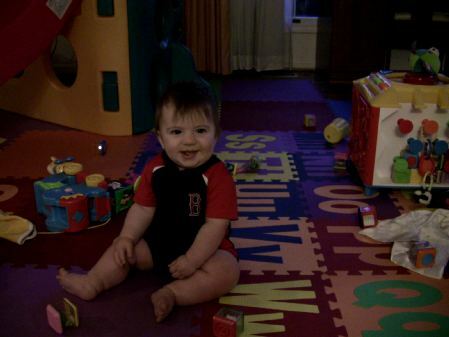 I know how much Carol loves the Boston Red Sox so I thought of her when I pulled this outfit out of a box of outfits a friend passed down to Nathaniel. Check out Nathaniel’s new digs. Sorry the picture is so dark, but we get funky light in his playroom. 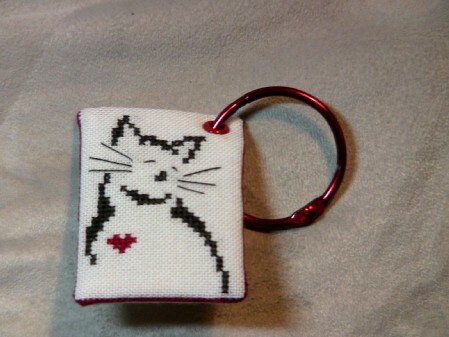 I have also been doing a little bit of stitching along the way. 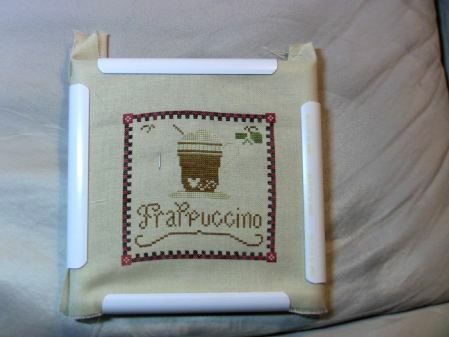 i am currently working on Frappuccino by LHN. I really enjoy stitching their kits. Well off to watch the rest of Batman Begins. Have a great Saturday! Yay Nathaniel – he looks awesome!!!!!! Summer sure is winding down.. sad, isn’t it?? I hope you have a wonderful birthday next week!! Frappuccino is looking great Leslie. I find LHN designs so relaxing to stitch. I like your Frappuccino! I am working on Caffe’ Latte right now and loving it. What a cute little giftie from Carol. Great progress on your WIP! Very nice floss tag & LHN stitching : ) tho, I think Nathaniel steals the show!! Love your Frap ! And that baby is just adorable!